What’s the German word for Tiki-taka? There are many things that JOE would like to accomplish with the remainder of our lives like climbing Mount Everest, drinking a beer from every country in the world or marrying Jennifer Lawrence. All in good time we say but one of our main life goals is to get Pep Guardiola and Sam Allardyce in the same room and hear what the two lads have to say to each other about football. We think it would be hilarious because one of these men is a wildly successful world famous coach whose ideas have helped revolutionise the beautiful game with his belief that possession and movement is key to winning any football match. The other is obviously Pep Guardiola. Pep’s Bayern Munich team were at their ruthless best in their 4-0 win against newly promoted Paderborn as Robert Lewandowski opened his account for the German champions in sublime fashion. 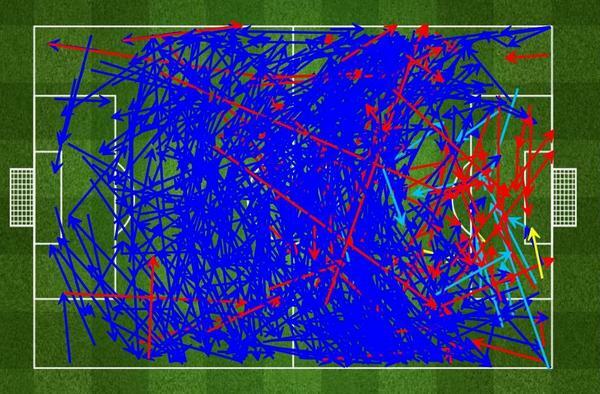 Bayern were also totally dominant in possession as seen by this passing map. Wow. When it was all over, 27 of 30 penalties had been converted, Middlesbrough were on their knees in despair and Liverpool were too shattered to indulge fully in celebration. One of the most remarkable shoot-outs in English history brought relief for Brendan Rodgers’ team as they edged into the fourth round courtesy of an exhausting finale at Anfield and one final miss from the unfortunate Albert Adomah. The Middlesbrough winger sliced the 30th and final spot-kick into the Kop to settle a seemingly never-ending tie at 10.42pm. Both teams had gone through the card in the shoot-out, goalkeepers included, with Patrick Bamford, whose penalty in extra-time stoppage time carried the Championship club so far, and Raheem Sterling having efforts saved before Adomah’s miss. It was the longest penalty shoot-out in the history of the League Cup, the previous record set at 9-8 on three occasions, and more extensive than the FA Cup’s highest total when Macclesfield beat Forest Green 11-10 in 2001. Of major English competitions only the Football League Trophy can equal it, also boasting a 14-13 shoot-out. Rodgers could afford a wry smile afterwards, even though Liverpool’s defending and lack of creativity were evident again, and this time against Championship opposition. It was simply cruel for the Boro manager, Aitor Karanka, having seen his side twice come from behind and pose a persistent threat all night. In normal circumstances this would have been the night Jordan Rossiter claimed the headlines, having marked his Liverpool debut with the opening goal from 30 yards. But with Liverpool unable to defend set pieces, enabling Adam Reach to head in a deserved Middlesbrough equaliser, Kolo Touré conceding a ridiculous penalty in the 122nd minute and both sides showing rare composure during the shoot-out, normality took its leave at Anfield. Rossiter, a 17-year-old born not far from Anfield, has caught the eye in Liverpool’s youth teams in recent years and prompted inevitable comparisons with a young Steven Gerrard given his position, background and severe teenage haircut. It is premature of course, even though Robbie Fowler has also announced the midfielder has the potential to follow the Liverpool captain’s career path, but a long-range goal on debut is not a bad way to start. Lucas Leiva’s through-ball should have been routine for the on-loan Chelsea pairing of Kenneth Omeruo and the goalkeeper Jamal Blackman as it rolled into the Middlesbrough area. Blackman, making his Boro debut, came but failed to collect, spilling the ball to Rickie Lambert but blocking the Liverpool striker’s first-time shot. The rebound fell to Rossiter who drove low from distance under the goalkeeper’s poor attempt at an interception and into the centre of an unguarded goal. The goalscoring debutant’s reaction was one to behold: a combination of astonishment, bewilderment and delirium producing a celebratory routine that had clearly not been rehearsed. Boro threatened on the counter-attack and from set pieces all game. There may have been greater energy and purpose to the Liverpool performance in the second half but, as has been the case for most of the season, it came almost entirely from Sterling, whose 122-minute outing was not ideal preparation for Saturday’s Merseyside derby. Lazar Markovic was anonymous on his second start for the club, Adam Lallana’s work-rate could not be faulted but the £25m summer recruit was unable to find an end product while his former Southampton team-mate Lambert endured a difficult first start of the season. The boyhood Liverpool supporter was also handed the captain’s armband for the night, despite having appeared only as a substitute previously. Middlesbrough levelled from an inevitable source when Mamadou Sakho was penalised for handball and Grant Leadbitter’s free-kick was glanced in by Reach. Adam Clayton had a chance to knock Liverpool out in the 85th minute but his close-range shot, after he was released by Lee Tomlin’s clever reverse pass, struck the outside of a post. Then Suso appeared to have decided the outcome when he fired through a crowded area in extra time. Bamford’s penalty, after Sterling had surrendered possession and Touré sent the on-loan Chelsea player sprawling, confirmed otherwise. It was merely a dress rehearsal for the madness to come. Premier League – Blundering Manchester United suffer calamitous defeat at Leicester – Yahoo Eurosport UK. Scholes: Liverpool are Champions League dark horses | FourFourTwo. Daley Blind brings game intelligence to Manchester United’s midfield – Telegraph. Manchester United selling Danny Welbeck to Arsenal highlights a lack of foresight | The Times. Premier League – Paper Round: United to offer Ronaldo astonishing wage – Yahoo Eurosport UK. United set to unleash glut of new signings on QPR – Yahoo News. Gary Neville: I’m baffled by Manchester United’s sale of Danny Welbeck to Arsenal – Telegraph.